Electric vehicles are finally starting to become a bit more popular but still only make up a tiny fraction of all automotive sales. We’ve seen electric cars, motorcycles, boats, and even bicycles. An electric bicycle with its own battery pack is cool and all but what about a bicycle that is powered by an electric drill? It’s definitely unique but I don’t know if it’s a terrible idea or something interesting and worth looking into. 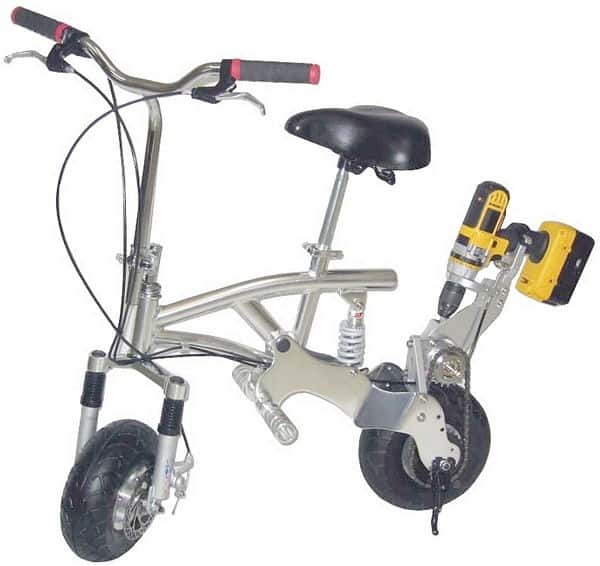 I’m not sure how much electric bicycles go for these days but the $849 DPX Drill Powered Bike is an aluminum based mini-bike featuring dual-disc brakes, front and rear suspension, and a special bracket which will allows any cordless drill to act as a power plant. All you have to do is slot in your choice of an 18 or 36 VOLT drill, and you are good to go. The DPX Drill Powered Bike can carry a passenger weighing up to 250 pounds, and can get up to speeds as high as 15mph. 15mph may not seem like a whole lot but then again, we are talking about a cordless hand-held electric drill. A full charged drill will provide approximately 20 minutes of riding time which may not be enough to get you around town but hopefully it’s enough to get you to the corner store for snacks. According to the company, it should carry you anywhere between two six miles depending on the type of battery your drill takes. The aluminum frame of the bike is anodized and weighs in at 33 pounds. The going rate for the bicycle is $849 and that price does not include a drill. The setup is for a Dewalt XRP drill in 18 Volt or 36 Volt model but you can contact the company regarding other drill models. If you decide to order this bike, just keep in mind that it will take three days of assembly before the unit gets shipped out. So, would any of you guys actually consider this mini-bike? Good idea or terrible idea?